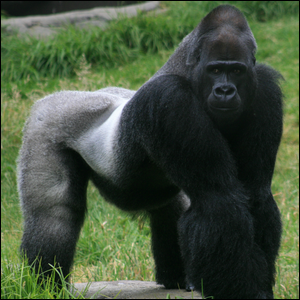 “Silverbacks” Are Not A Distinct Species Of Gorilla, The Name Is A Designation Of? If you grew up thinking that silverback gorillas were a distinct and majestic species of gorilla, we’ll absolutely forgive you because, full disclosure, for a pretty long time in our own youth we thought the same thing. It turns out that there are only two species of gorillas: the Eastern and Western gorillas (both, sadly, critically endangered), and a handful of subspecies under each of those two umbrellas—none of which is a species of silverbacks. That’s because silverback isn’t a term that denotes a specific species of gorilla, but is instead derived from the appearance of an aged male gorilla. Just like a human male with distinguished gray hair, gorillas also go gray with age. The reason silverbacks appear so often in literature and documentaries about gorillas is the important role they play in gorilla societies. Because they’ve survived long enough to get their honorary silver hair, they’re typically wiser, stronger, and bigger than the other members of their group (called a troop). Silverbacks are in charge of making decisions, mediating conflicts among troop members, and protecting the troop, especially the younger gorillas and females, and have been observed fighting to the death to protect them. Image courtesy of Brocken Inaglory.